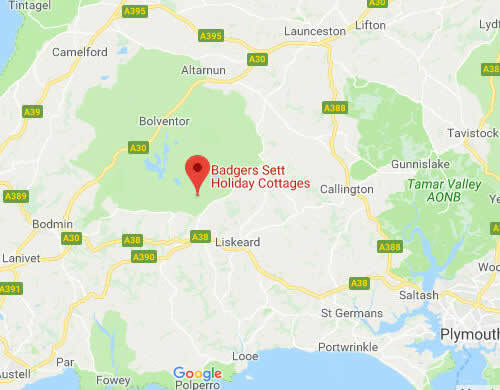 Badgers Sett is only a few minutes drive from both the A38 and A30 and offers ample on-site car parking. Head west on the A38 towards Bodmin: pass the Liskeard exit and take the next exit (signed Moorswater Industrial Estate). At the junction turn right (signed Dobwalls). Take the next right turn (signed Siblyback Water Park and St. Cleer). Carry on along this road for approximately 0.7 miles until you come to a T-junction. At the T-junction turn right (signed King Doniert's Stone and Siblyback – these are brown signs). Continue along this road for 1.7 miles until you come to the signpost marked Draynes 1 and Golitha Falls and Bolventor 7. Turn left here. Travel for about 300 yards, and take the first left over the little stone bridge (signed Golitha Falls and Car Park). Continue along this road for 0.9 miles. Badgers Sett is on the right-hand side (the last house in the hamlet). Head west on the A30 towards Bodmin until you reach the turning signed Jamaica Inn (this is a brown sign) and Bolventor (note that this turning is about 11 miles from the junction with the A388 at Launceston). At the end of the slip road take the first left turn (signed St. Cleer and Golitha Falls). Carry on along this road for 6 miles, taking the right turn over the little stone bridge (signed Golitha Falls and Car Park). Continue along this road for 0.9 miles. Badgers Sett is on the right-hand side (the last house in the hamlet). The nearest train station is at Liskeard (about 5 miles away). This is on the mainline to London and offers regular services to London Paddington – journeys take around 4 hours. Onward travel to Badgers Sett can be made by pre-booked taxi. Alternatively, if travelling from London you could leave the train 30 minutes earlier at Plymouth where meet-and-greet car hire services are available at the train station. Plymouth is around 25 miles from Badgers Sett. Newquay Airport is just 25 miles from Badgers Sett and offers good UK flight connections as well as car hire. Exeter Airport is 65 miles from Badgers Sett and offers a good range of UK and European connections. Intercontinental connections can be made through London, Paris or Amsterdam. Car hire is also available.